Fiction – paperback; The O’Brien Press; 174 pages; 1994. The Mammy is Irish comedian Brendan O’Connell’s first book. It’s a very simple tale about a widow struggling to raise seven children on Dublin’s north side in the late 1960s. Each chapter is essentially a short story centred on the individual characters that make up Agnes Browne’s family. There are funny little episodes with not-so-funny punchlines, and the language, studded with ‘Dublin-speak’, is very stripped back to the point of being boring. Aside from these faults, it is a lighthearted story — punctuated with pathos — about a family on the wrong side of the tracks, the strength of friendship in trying times, and the essential goodness of people in a more naive era. 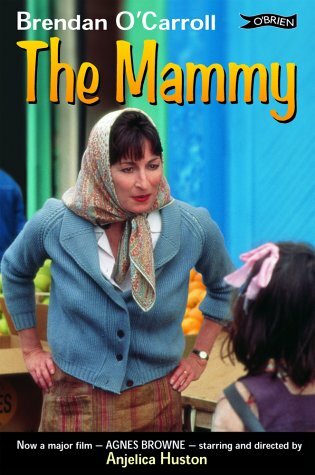 Apparently the book has been made into a film starring Angelica Houston, and while I haven’t seen it, I think it would probably be more entertaining than the novel. I don’t know what book you read, but this book deserves more than 1 star. I would give it five! Get a sense of humour about you. It is a fantastic book, as are “The Chisslers” and “The Granny”. Our copies are nearly worn out and have been read by many people. I am looking to buy more copies to share around. This book deserves five stars as do the others in the series. These books are amazingly witty and funny. I fell in love with Agnes and her boys. The characters are very real and endearing. At times I laughed so hard my tummy hurt and I also cried with the family as they endured some tough times. Very readable…my only disappointment is that I have read them all and I miss the characters. Still I will never part with the books. A must read! I quite liked this book. I love the book so much, I bought all the others. It was wonderful. Wow! Get a funny bone my friend. Each and every book does not have to be a literary masterpiece. Entertainment is also an important element of a good book. Just park your brain and enjoy.